For a woman who has turned to the flexitarian way (more veggies, very little meat) for the past year or two, I seemed to also have developed an odd fascination with all things pork. Especially pork belly. It is odd, but if it’s a phase, I’m totally running with it. Case in point. 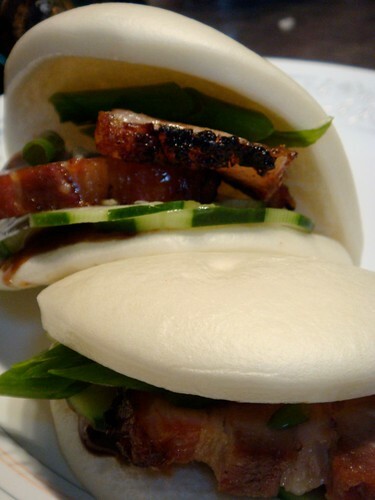 The Pork Bun. 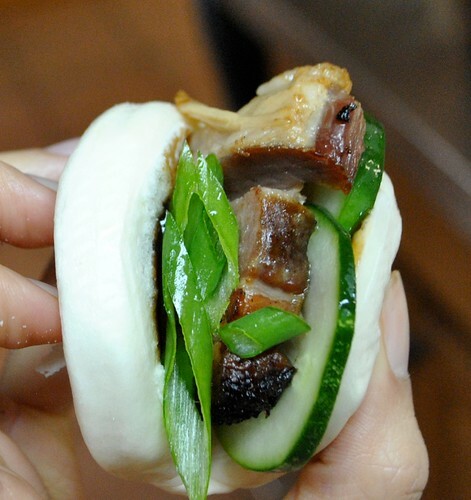 Not the steamed pork bun you find in Chinatown, fluffy white bread stuffed with a deliciously sweet and savory chinese roast pork. This one is somewhat of a remastered version brought to life by the super awesome David Chang and his Momofuku Noodle Bar. I’ve actually never had the pleasure of eating at any of his restaurants. Although, as mentioned in the previous post, I did get to sample the candy bar pie from Milk Bar. It is sitting in my freezer right now. Can’t let it go to waste. Bygones. Onwards to the point of this post. My brother, Andrew, got me the Momofuku cookbook for Christmas last year. It’s a pretty interesting read about his stories behind some of his dishes. The recipes range from pretty easy (like these pork buns) to, good to know but I’ll just leave it to the professionals, difficult. 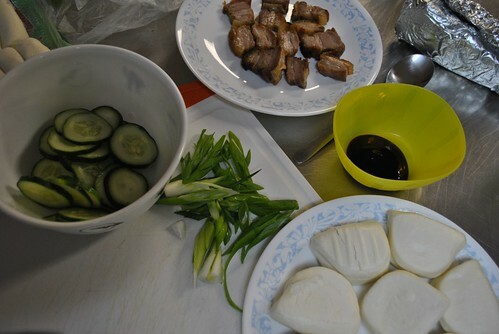 I usually get my pork belly from one of the busier (busier = quicker turnover) Asian supermarkets. They usually have very nice thick slabs of pork belly available, but with skin still on, and origin unknown. After 15 minutes of struggling with de-skinning the darn thing, you become a pro. This time I went to my local Whole Foods and used my Living Social voucher to help subsidize it. 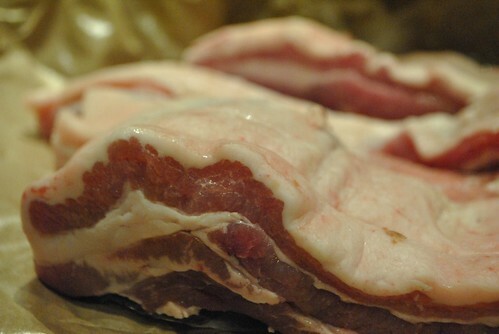 The pork belly slabs were thinner, skinned and origin better known, which you end up paying extra for. 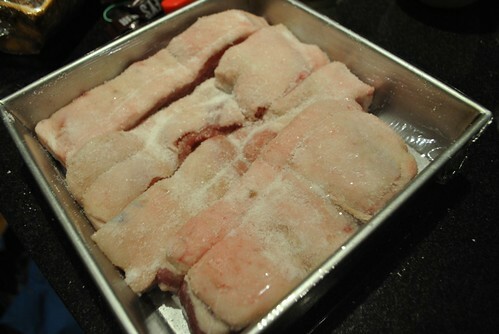 Pork belly in hand, and the night before I was planning on roasting it up, I took out my trusty 8×8 pan, mixed together 0.25 cups each of kosher salt and sugar, and rubbed it all over the belly before nestling them in the pan. I covered the pan with plastic wrap and put it in the fridge over night (but no more than 12 hours). 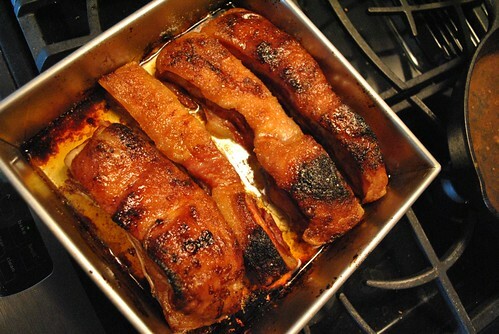 The next morning, I cranked up my oven to 450 degF and once up to temp, took out my pork belly, poured out any liquid and put it into the oven for an hour (sans plastic wrap of course), basting at the 30 min mark. Then the oven temp was decreased to 250 deg F and I let it slowly roast till it was tender, about 1.5 hours for me. 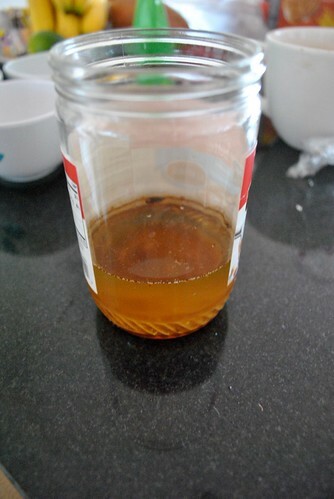 This is why I save my jars. Reuse! I snuck a piece (had to taste the goods) then wrapped them and put them in the fridge to chill. It was crispy, melt in your mouth deliciousness. About a half hour before I planned on serving, I sliced up some cucumbers (Kirby) into thin-ish disks and tossed them in a teaspoon of salt and tablespoon of sugar and put it in the fridge. The I sliced up some scallions, pour out some Oyster flavored sauce (my preference over the Hoisin sauce he calls for), and sliced up some pork belly from the fridge and reheated them on a pan. When I was ready for assembly, I reheated some frozen mantau bau (Lotus leaf bread as the package sometimes calls them) wraps (they aren’t thin like a wrap, but not bau shaped like a mantau bau is usually) in a microwave as per the manufacturers directions. This entry was posted in Uncategorized and tagged pork. Bookmark the permalink.